Since 2000, the “Have a Heart, Do Your Part Radiothon,” presented by 98.1 WKDD, has provided patients and families the opportunity to share their personal stories on the air, prompting hundreds of listeners to call in with pledges to Akron Children’s Hospital. This year, our community had a heart and raised nearly $500,000 for Akron Children’s during the three day event. The Radiothon kicked off with a “Change Bandit Bash” on Wednesday night which was held for the first time at the Akron Zoo. This year, just over 50 Change Bandits “robbed” their friends and family for spare change to donate to the hospital. The Change Bandits and their families celebrated the spirit of giving with food, music and by getting a close look at zoo animals. Despite very snowy conditions and cold weather, the Radiothon team persevered to broadcast live from the atrium lobby at Akron Children’s. On-air personalities Keith, Tony and Meg from WKDD and volunteers were very busy sharing stories of patients, schools and community members, as well as asking listeners to call in and make a one-time or monthly pledge. Through the generosity of callers, Radiothon raised $481,277.98 to benefit patient programs and for the purchase of child-sized medical equipment, according to Nicci Avalon, Children’s Miracle Networks program manager for Akron Children’s Hospital. 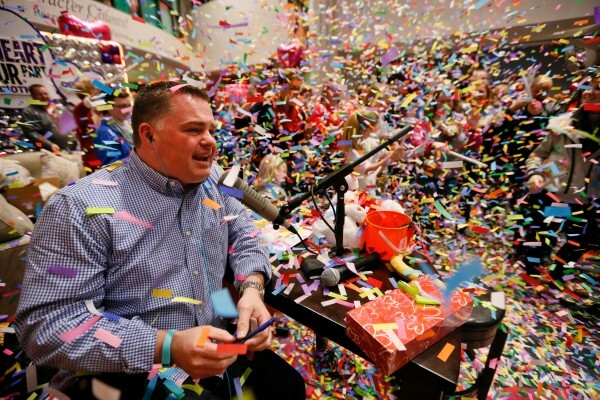 In its 16th year, the Radiothon has raised more than $9.3 million for the hospital.